With a roll-out bucket, no task is too big for agricultural, construction and landscaping professionals. The new roll-out bucket from John Deere comes in three different widths, designed to accommodate a wide range of tasks out in the field. The latest roll-out bucket from Deere is optimized for G-Series Compact Track Loaders and K-Series Compact Wheel Loaders (RB84 and RB96). This means that they can provide an additional 34 inches of dump reach when they are fully extended. 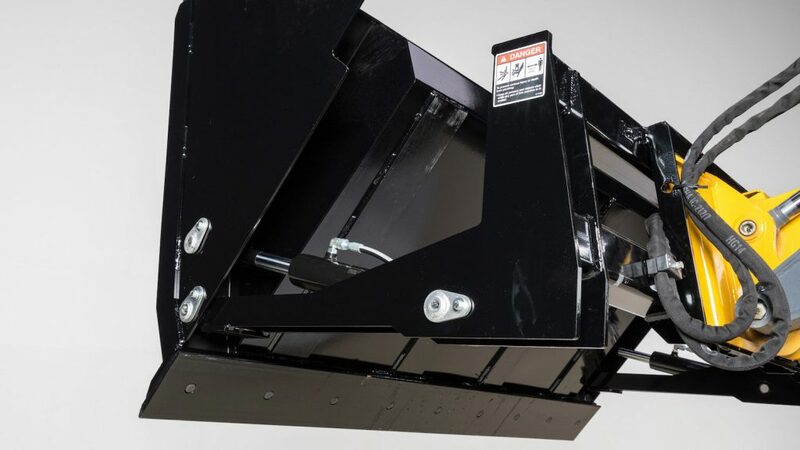 The bucket is also designed to utilize the machine’s auxiliary hydraulics to roll out and dump material at a significantly higher dump height. It pivots near its cutting edge, rather than require the machine hinge pin to be raised higher than the hopper for dumping. This provides additional dump height as well. With 114 degrees of rollout, operators also have optimal spillage control. For better ease of use, the roll-out bucket is compatible with the Quik-Tatch™ attachment system from John Deere. This allows operators to switch from one type of attachment to another within seconds. The roll-out bucket was also designed with durability in mind – it incorporates high-strength, large-diameter pivot pins for longer life. The RB72 roll-out bucket has a weight capacity of 1,170 pounds and is 73 inches in width. It can reach a height of 32.3 inches, and it has a dump reach of 34 inches. When extended, it can reach 50 inches in length. Similar to the RB72, the RB84 roll-out bucket has a dump reach of 34 inches and can reach 50 inches and length. However, it has a width of 84.75 inches and a maximum weight capacity of 1,275 pounds. The RB96 roll-out bucket also has a dump reach of 34 inches and can reach 50 inches in length. That being said, it has a wider width than the other two buckets, with an extended width of 97.5 inches and a weight capacity of 1,360 pounds. If you have any questions on any of the John Deere roll-out buckets, contact your local John Deere dealer.